When September hits it is hard for me to not think about Steelhead. Although September is early to find steelhead in most eastern Oregon waters, it doesn’t stop me from dreaming of them, tying flies for them and heading to the river to try and welcome the early arrivals. For the past several years I have made September hikes down the Imnaha River trail fishing my way to the Snake in search of early steelhead. There are never many, but usually I manage to find a few willing. Last year I was super disappointed to come to a road closed sign in September due to a fire on the lower canyon. Granted the canyon was full of smoke and probably would not have been very enjoyable to fish. So last year I was thwarted in my early attempts at the Imnaha and didn’t get to enjoy its steep canyon walls until the beginning of October. The canyon had burned in places on river right, but this is dry hot country that probably burned often before we humans had helicopters and such to fight the fires in the steep Snake River country. This year a fire started near the mouth of Cache Creek on the Snake River nearly in the corner where Idaho, Washington, and Oregon meet. This fire has burnt almost 74,000 acres so far and shut down the Dug Barr Road for a while. By the time my wife and I drove down September 18th, nearly a month after the fire started, the road was open but the fire is still burning and the canyon somewhat smoky. We met Jeff and his dad, Ted, at Cow Creek Bridge where they had spent the night. We headed down the trail with the intention of walking the 5 miles to the Snake and then fishing our way back upstream. Last year’s fire had burned the canyon walls on river right but never really made its way down to the river. 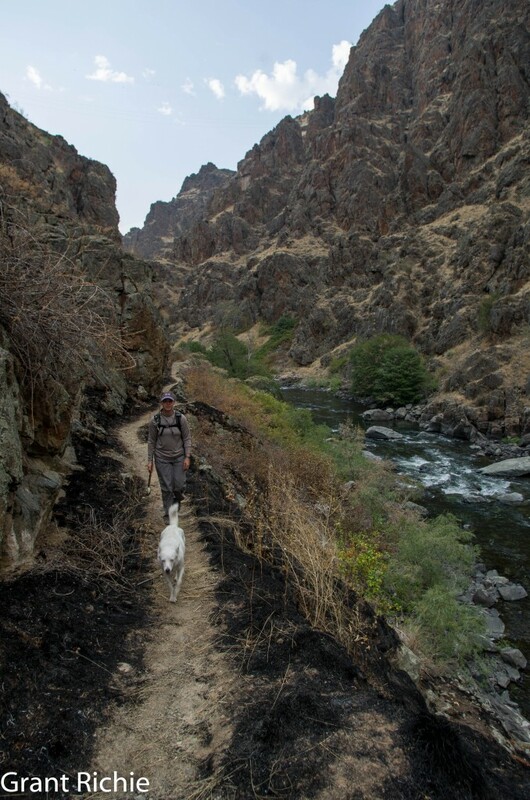 This year’s Cache Creek fire burned to the trail in many places and jumped the trail in some spots to burn right to the river. Although the fire burned out many of the blackberry brambles, it has made the trail more difficult in some areas where the blackberries are now falling dead over the trail. I couldn’t handle walking by the whole river without fishing on the way to the mouth so we stopped every so often and fished a good run or pool. The water is really low and exceptionally clear right now. We usually receive at least a couple of small rains that help keep river flows up a little higher. I fished a very basic setup all day: an olive woolly bugger with a flashback stonefly and sometimes a smaller nymph behind that. The rainbows really liked the stonefly. Throughout the day I caught many small, wild rainbows and several fin-clipped hatchery steelhead in the 14” range that have failed to migrate to the ocean yet. About half way down to the mouth a bright wild steelhead took my flashback stonefly. I love catching steelhead this time of year. They are so full of fight that you never know if you are going to land them or not. I got this bright wild hen to the bank twice before she finally went free. Grant hooking into his first steelhead for the season! As we progressed down the canyon the smoke became worse and worse. At the mouth the smoke bothered me a bit, but not bad enough to quit fishing and hike back up. The flows on the Snake River can vary widely from season to season, day to day, and hour to hour depending on the electricity needs at Hells Canyon Dam. The mouth of the Imnaha will vary accordingly. Sometimes it is a big pool with only a small current flowing out to the Snake. 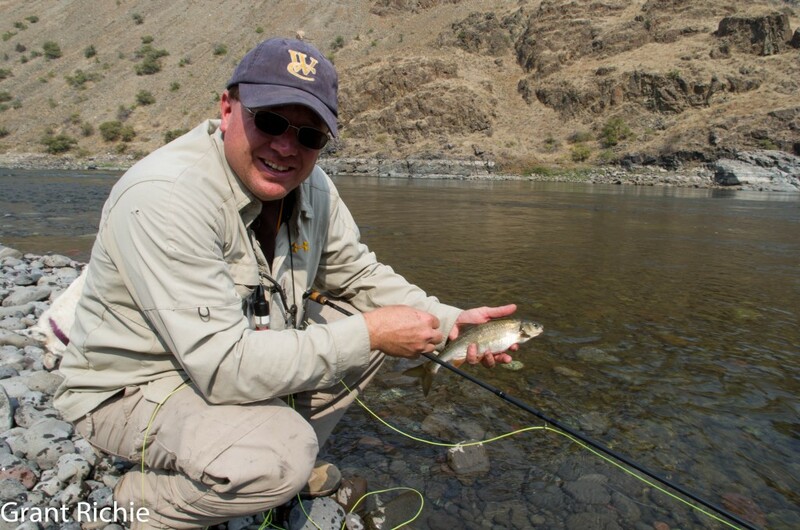 Today the mouth of the Imnaha was shallow and offered very little good holding water for steelhead. Jeff, Ted, and Lottie had reached the mouth before me and were all busy fishing. I was hungry however and sat down and ate my lunch while they fished. I had finally finished another one of my switch rods. I am trying to get a bunch of switch rods together so I can do a good in depth, side by side switch rod review at the end of the steelhead season. I am looking at comparing 8 different 7 weight switch rods side by side. Basically the kind of review I wished I could have found when I was looking to get my first switch rod. I added quite a few switch rods to my families quiver last fall and we are adding several more this year. With 5 people fly fishing, we need a lot of rods anyway and with only 3 switch rods done last year, at least 2 people have been left out of using a switch rod every trip. And, trust me, once you use a switch rod for steelhead on medium to bigger sized rivers like the Grande Ronde, well, you won’t want to go back. After I finished my lunch I picked up my latest switch rod build, a Beulah Platinum 10’8” 7 weight. I worked a little line out and easily cast an olive woolly bugger, flashback stonefly, and an October caddis pupa of sorts across the river. Let me just focus you on the easily part of the cast. With a single handed rod, that would not have been easy and that is why I have come to love switch rods over the past year. Switch rods make everything easier. I made my easy cast across the river to the channel Jeff pointed out. My drift was not going to be long because there was a large rock mid-stream that my line would wrap around. But the large rock didn’t matter on this cast because a steelhead took my flashback stonefly after a foot or two drift. The drift was short, that is all I know and then I had a large fish swimming hard and fast at me. I first tried to strip in line fast enough but I was going to lose the battle and simply started to run backwards and strip line at the same time so I could keep tension on the line. I knocked my hat off in the process, a dangerous thing for balding people such as myself in the sun, but I managed to keep the fish on the end of my line. I got to fight another bright steelhead as it surfaced twice, but it was soon gone much too early. That was the end of the steelhead for me for this day. The smoke was a bit bothersome at the mouth of the Imnaha, but what was more bothersome was the constant drone and waves from jet boats going up and down the Snake River. I have never seen so many jet boats down there. There are always some jet boats, but not like today. This was nearly as bad as being in town. I was happy though, even with jet boats droning on in the background. It was early enough that I could have just as easily not hooked any steelhead and I hooked two. September hikes on the Imnaha are really more about hiking, getting out, and returning to a place I love to be. 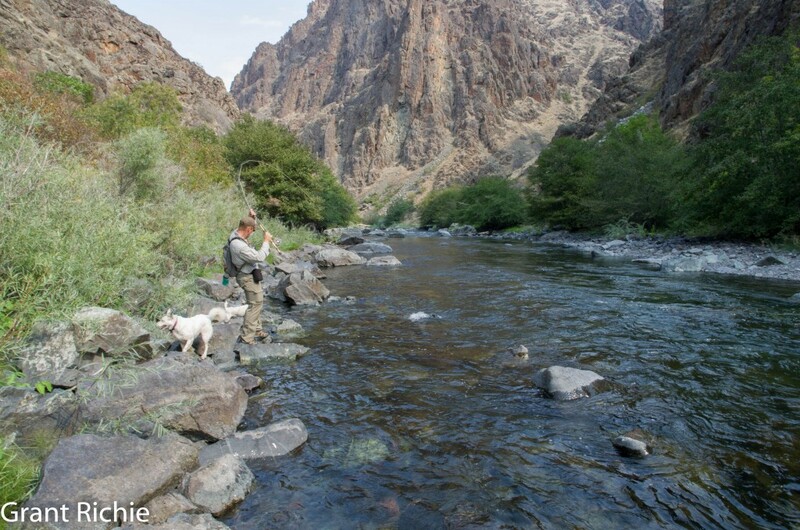 It is rather funny; I have felt a deep draw to the Imnaha for many years and it was only after fishing it for two years that I discovered my brother was born on the rims of this canyon and my father worked on many of the ranches here as a young man more than 30 years ago. It seems that my feet and bones know more than my brain sometimes. This rocky soil of the Imnaha nourished my families bodies long before I came here unwittingly and now it feeds my soul. Visit our guided trips page to view information about joining me for a guided steelhead trip on the Wallowa and Grande Ronde. This entry was posted in Imnaha River. Bookmark the permalink. The Imnaha in Sept. Looks great Grant. I own several of the Beulah Platinum Series rods including that same 7wt switch. Which line are you liking on it for summer work? I am using the Rio 7/8 Switch line. That is what I had. Do you have a line preference for that rod? I used the Beulah with the Rio line again on the Grande Ronde this past weekend and couldn’t complain. Is that Rio a Scandi or a Skagit? Honestly, I really like my 12’6″ 6 wt for rivers like the Ronde and bought the 7 wt switch more for winter work in really tight overhanging tree conditions. I was going to try to get to the Ronde this year for a fall float and wanted to try the 7 wt switch, but only have the Skagit switch line for it so far. I purchased the new Airflo Rage line to try out but will probably try the Beulah switch Scandi line as well. They both have the same length head. I’ve heard a lot of good things about the Rage line. It sounds like it’s a sort of hybrid between a Scandi and a Skagit and is suppose to work with both sink tips and polyleaders for both sinking and dryline work. I have fished 6 weights for steelhead in the past but I think a 7 weight handles fighting steelhead better. I often felt underpowered with the 6 weights. Early in the year I also like to fish double bunnies and strip leech patterns and the 7 weight casts the bigger flies better. On smaller rivers I will often fish three different patterns such as a double bunny, stonefly, and then a smaller copper john or something else. When I began fishing the Grande Ronde I couldn’t cast the heavy three fly setup as far as I wanted it to go so I began using woolly buggers instead of the double bunnies and strip leech flies. Now with the switch rods and the Rio Switch line I can fish whatever I like and cast it as far as I need to. This past weekend I tied on a double bunny, olive woolly bugger, and a stonefly nymph to test out the Beulah. It handled it fine. The Beulah Platinum Switch seems to be an excellent rod.